Opposition Leader Yitzhak Herzog gives live interview at AIPAC conference, praises current US ambassador to the UN for defending Israel. 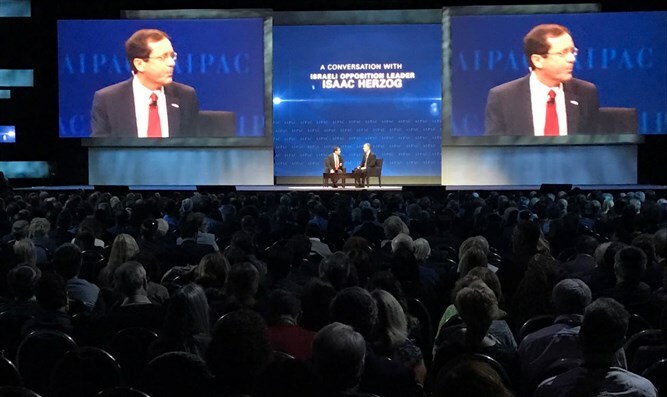 Opposition Leader Yitzhak Herzog was interviewed by Jerusalem Post editor-in-chief Yaakov Katz live on stage at the annual AIPAC Policy Conference in Washington DC Monday. Herzog thanked the AIPAC organization for "acknowledging [the upcoming 20th anniversary of the death of] my late father, [former President of Israel] Chaim Herzog." Herzog recounted his father's famous speech at the UN following the passage of General Assembly Resolution 3379, which declared Zionism to be racism. Then-Ambassador Chaim Herzog symbolically tore up the resolution "in front of the whole world." "His colleague then was the US ambassador, Daniel Patrick Moynihan, a great American and Ambassador Nikki Haley is following in his footsteps," Herzog added. He also recounted how his grandfather, Israel's first Chief Rabbi, Rabbi Yitzhak Halevy Herzog, met with then-President Franklin D. Roosevelt in 1941, seven years before the establishment of the state of Israel, to ask him to rescue the Jews of Europe from the Nazi killing machine. "AIPAC was not there. Israel was not there."